The Saturate group show at the Chase Gallery will feature six Inland Northwest artists working across a wide variety of media: Jiemei Lin, Jeff Ferguson, Brandon Johnson, Geetha Alagirisamy, Antonio Romero and Azzah Sultan. Their collective works include paintings, prints, photographs, video installations, fiber arts and ceramic pieces. The artistic journeys vary. For example, Ferguson will display photos of past pow wows. Sultan will share the struggles that Muslims, women of color, and immigrants face. Artists’ reception is from 4 to 7 p.m. Friday. City Hall, lower level, 808 W. Spokane Falls Blvd. 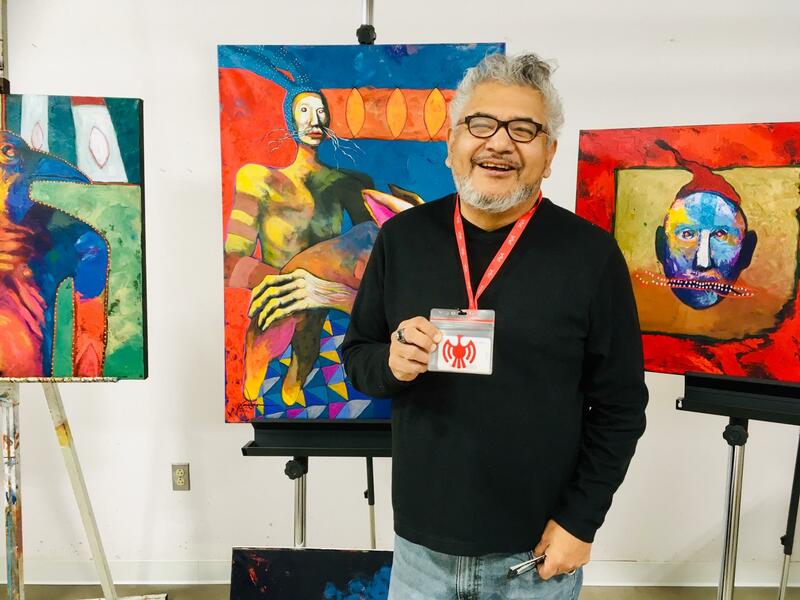 Local legend Ric Gendron will show new paintings he produced while at a recent artist residency at the prestigious Institute of American Indian Arts in Santa Fe. His visions combine psychedelic relevance with ancient wisdom. Marmot Art Space in Kendall Yards. 1202 W. Summit Parkway. Just a block away on Summit is William Grant Gallery & Framing’s exhibition of the salted copper wall art of Anthony Gallaher. His use of salts to create beautiful pictures is fascinating. 1188 W. Summit Pkwy. Local art pioneer Bob Kraut is back at the Kolva-Sullivan Gallery with a new exhibition focused on discoveries derived from experimentations with fluid paint. The show “Test Tubes – Measurements of Experimentations” was produced by Kraut’s own innovative process of “paintskins,” in which he paints images on glass, then peels them off and reverses them before mounting, smooth side up, often in layers. The large, hanging test tubes of otherworldly imagery are colorful explorations. The only conclusions to be made from these trials in paint may be that Kraut is a true original. 115 S. Adams St.
New Moon Art Gallery will showcase craftsman Antonio Fletcher, who works with wood ethically sourced from fallen trees, demolished buildings, and shorelines. You may want to start there, since the gallery will be open from noon to 6 p.m. 1326 E. Sprague Ave.
Not far from New Moon is The Clay Connection, where artist James McLeod will exhibit his clay molded into animal forms. 714 E. Sprague Ave.
Did you say “pop-up?” Yes, please. The Art Spirit Gallery, Coeur d’Alene’s fine arts institution, is spreading its wings to create AS2, a pop-up gallery under the direction of Andrew Whitver. He may be a newcomer to Spokane, but Whitver is no stranger to the progressive art scene. In 2013, he and partner Kevin Brannaman launched Calypte Gallery, a pop-up gallery on Capitol Hill in Seattle that featured work by established and upcoming Seattle artists. First Friday marks the kick-off for AS2, in Spokane’s iconic Wonder Building. For the inaugural exhibition “Spring Forward,” Whitver and fellow curator Kim Deater will showcase work from well-known local artists and personal Seattle favorites. 835 N. Post St.
Local photographer Grace June brings The Survive Project, her depictions of survivors of suicide. The exhibit will be on display at the downtown Spokane Public Library for April and May. 906 W. Main Ave. This article has been updated to reflect the correct address of the Wonder Building. Published: April 4, 2019, 4 p.m. Updated: April 4, 2019, 4:04 p.m.